As lag screws are ideally used to connect heavy lumber or heavy materials that are bearing intense load, it is of utmost importance that the lag screws you use are of the solid quality. This is what we offer at Keble’s Trading. We have a scope of lag screws from lag screw double threaded G304 in sizes M10x75 to M12x300, and also lag screw double threaded G316 in M6x100 to M12x300. We source our Double Thread Lag Screws from globally reputable companies to give you that confidence in doing your handrail projects. 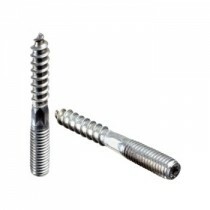 Turn to Keble’s Trading for reliable-grade LAG SCREWS DOUBLE THREADED. Talk to us! We speak your language! We understand your business. Call us at 1-800-067-687 or fill out the contact us form below. No inquiry is too large or too small. We would love to be of service to you today!